Globalisation is nothing new to philatelists. From the moment that collecting stamps became a hobby in a few countries, it also became a global trade. When a country joined the club of stamp-issuing countries, at least one person started to ship the new issues out of the country and make some kind of business out of doing so. In some cases, they shipped to lots of other countries; in other cases, they shipped to a select few and specifically to the biggest dealers: Moens in Belgium, Senf in Germany, Gibbons in Great Britain, and so on. One hundred and fifty years ago and even more recently, there were often restrictions on both exporting and importing. In some countries, like the old Soviet Union, private individuals could only export through official channels, specifically the Soviet Philatelic Association. Even now, there are “heritage” restrictions on exports from countries like Russia and Poland. Those restrictions are often ignored, and always have been. Stamps are very portable and if you don’t want to follow the rules, it’s very easy not to. Countries sometimes impose restrictions on imports, making duty payable on stamp imports. If I buy something in a Swiss auction, then I expect to be charged 5% import VAT. But sometimes an official mistakenly charges me 20% and sometimes nothing at all – when they can’t cope with the volume of work, I suspect they just let some things through. If people don’t want to pay import duties, then often enough at the airport they walk things through Customs. One way or another, we have globalisation and it’s a bit like the famous Six [ or Seven ] Degrees of Separation. 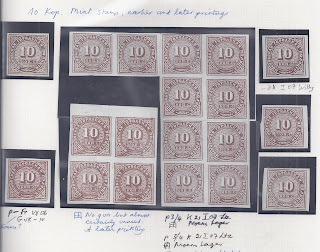 In fact, for New Issues it must be unusual for there to be as many as seven links between a person buying stamps at a post office counter and a collector buying those stamps across a stamp dealer’s counter. It’s more likely to be two. When we move away from New Issues to material which has been inside the philatelic world for decades or more, there is an interesting distinction between those stamps which constantly churn and those which are still only a few degrees of separation away from their starting point. 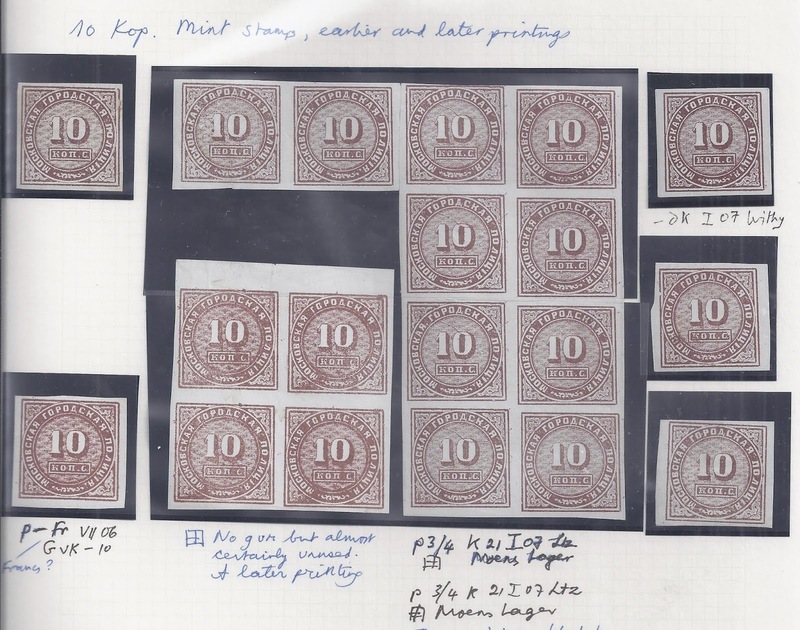 For example, there are “Investment” grade stamps like the 1929 British PUC Congress £1 stamp which circulate more or less continuously in auctions and have no obvious “provenance”. They are both common and anonymous. It is really only because they are investment items that they command prices which make it worthwhile for an auctioneer to present them as a Single Lot item. The PUC £1 is a common stamp. Over my quarter century as a stamp dealer, it has interested me that some of the material I handle is only a few degrees of separation away from its original starting point even when that starting point is over a hundred years away. In 1861, the Moscow Police authority issued its first stamps to indicate that someone had paid the fee to register their residence in the city with the police. In 1881, the rather crude first issue was replaced by a State Printing Works-grade second issue. I guess that it was around this time, that PERSON 1 approached someone in the Police department and enquired whether it would be possible to buy the unused remainders of the first issue (which might otherwise have been destroyed). With or without bribery and corruption, PERSON 1 got the stamps. They sold them on to PERSON 2, the famous Belgian dealer Moens, who put the sheets and part sheet into his stock. It’s possible that Person 1 and Person 2 were the same person, namely Moens, but I assume there was an intermediary. When Agathon Faberge died, the stamps passed to PERSON 5, his son Oleg Faberge, who probably put them onto new album pages. Late in his life, Oleg sold the stamps to PERSON 6, a Finnish collector B E Saarinen who took them off the new album pages. Then it becomes a bit unclear. We know that he sold on parts of his Faberge fiscal collection to another Finnish collector and to a British collector, but neither was the PERSON 7 who (probably after Saarinen’s death) kept or bought the best bits of the collection, including the ex-Moens mint stamps, and sold them at auction a couple of years ago to me, who is therefore PERSON 8 at the current end of a chain which stretches back to the 1880s. That’s a very short chain for 130+ years. In those 130+ years, the stamps have crossed from Russia to Belgium, back to Russia, out to Finland in 1927 when Agathon Faberge fled/ was allowed to leave Russia, and finally from Finland to the UK [directly?] under EU single market rules.